Buck-boost, buck and SEPIC topologies are also available from the same module, which comes in a high reliability (H-grade) version that guarantees operation from –40°C to 150°C. 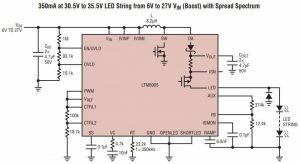 “The wide input voltage range and 150°C operation make this µModule LED driver ideal for automotive and industrial lighting applications,” claimed the firm. Inside are: a dc-dc controller, power switch, Schottky diode and current sense resistor, plus a p-channel switch for pwm dimming. Operating frequency is adjustable across 100kHz to 1MHz and built-in spread spectrum frequency modulation is provided to improve EMC measurements. 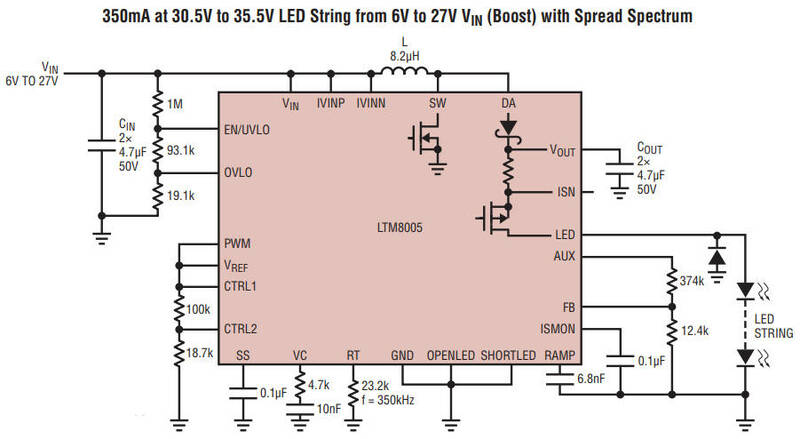 Brightness adjustment is through of the LEDs can be controlled by a pair of linear-rule analogue control pins – the one with the lowest current setting takes precedence, or PWM dimming with a range up to 3,000:1. Output-disconnect short-circuit protection is provide, as is open LED protection, programmable input current limit, input current reporting and output current reporting. E and I grades operate from –40°C to 125°C.